The Maglite 2D flashlight is renowned for its quality, durability and reliability, and has been around for a long time and continues to be a bestseller for Maglite. Now it is available using the MAG-LED technology. This flashlight is the upgraded version of the standard 2D Maglite flashlight, changing from the standard bulb to the LED light bulb. The body of the Maglite 2D LED is constructed of the aircraft aluminum,which is what the Maglite is known for and is a great weapon for self defense. At just 10″ long and a diameter through the body of 1 9/16″, the Maglite 2D LED is slightly bulky. This flashlight can run for about 8 hours which is nice if you are security guard, camper or just need this thing for power outages. Police officers continue to use these flashlights because of the reliability, price and construction. Since it is designed for professional and consumer use, it is water resistant and shockproof. So if you are looking for a classic flashlight to keep in your car, house, or tool box, this is a must have. You can use the side button switch for momentary illumination / constant use. 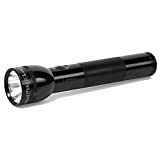 The Maglite 2D LED also gives off just over 130 lumens, it is sure to give you enough light to get the job done. Of all the flashlights that I own and have reviewed, I have to say that the Maglite 2D LED is the one I use the most around the house or garage. Especially during power outages in our neighborhood, this flashlight can stay on for long periods of time without getting hot around the bezel or running out of juice. When it comes to my camping trips to TN state parks, I have to take this with me because it is easy for any of my friends or family to grab to use. I have taken my more expensive flashlights but fear they will be damaged by the novice users. I have used this Maglite flashlight to pound tent stakes in the ground during a car camping trip and even used as a hammer to hit on y brake calipers on my Ford Expedition ( using as a hammer is not recommend ). Overall this is in the top 5 on my all time flashlights to use and I consider it a classic. Find out more about self defense flashlights check out bestflashlightspot.com by clicking on the link.